ASCOconnection.org is the professional networking site for the American Society of Clinical Oncology (ASCO) and the companion website for ASCO's official member publication for and about ASCO members, ASCO Connection. It is the primary source of information about ASCO’s programs and resources. ASCO Connection promotes opportunities for interaction between ASCO and its members, and members and their colleagues. 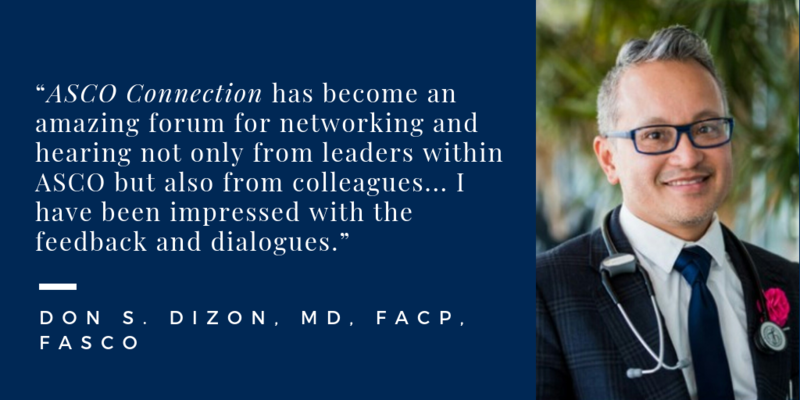 ASCOconnection.org features blogs from ASCO members and leaders, the online version of the membership publication as well as online exclusive articles, ASCO news, career development resources, and links to the ASCO Membership Directory and ASCO myConnection. A special edition, The Best of ASCO Connection Blogs, features engaging blog posts from the previous year and is distributed annually at the ASCO Annual Meeting. Learn more about our esteemed Bloggers and Editorial Board members. If you are interested in submitting a blog post or article, or want to learn more about opportunities for networking, contact us at ascoconnection@asco.org. ASCO Connection is an ASCO member benefit and is mailed in print to ASCO members in good standing. To change your mailing address or cancel your print subscription, please contact ASCO Customer Service. If you are interested in advertising in ASCO Connection, please review ASCO's media kit and contact Joe Frank, National Sales Manager at The Walchli Tauber Group, Inc.
All blogs and articles are open to ASCO members. However, members need to log in with their ASCO.org username and password to access member-only content and/or to post comments anywhere on the site. Nonmembers who log in with their ASCO.org Guest Account username and password can read and comment on most blogs and articles. However, some content may be reserved for members only. Nonmember guests who visit the site but who don't register an ASCO.org Guest Account can read most content. However, only logged-in visitors can comment on content. Please read the Guidelines for Commenting and Terms and Conditions before proceeding. APEX Awards recognize print and digital publications for achievements in graphic design, editorial content, and overall communications effectiveness. If you have questions or comments, contact us at ascoconnection@asco.org.